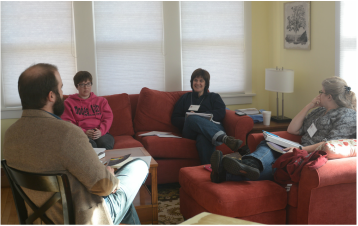 KSM welcomes anyone to take courses with us for personal enrichment or continuing education! May courses begin officially on April 15, the focus weekend takes place May 11-12, and final assignments are due June 7. That being said, you are welcome to spend the night at Upton Hall on Friday night, and join us for breakfast and morning prayer on Saturday morning. While the 8:45 colloquium session is a closed group for students on ordination and lay certificate tracks, you are encouraged to join us at 10:15 for our praxis session, which addresses some practical area of ministry. If you would like to audit a course, the tuition is $100. If you would like to take the class for credit, the tuition is $180. The cost includes meals and overnight accommodations at Upton Hall on Friday and Saturday night (on a space-available basis). If you wish to take the class for credit, we encourage you to enroll by August 13. If you wish to audit the class, you may register at any time prior to the focus weekend. However, your learning experience will be better if you have time to complete the assigned readings for the class. This course focuses on the Book of Common Prayer of the Episcopal Church as a prime source for personal and congregational growth in God's love. Your Instructor The Very Rev. Dr. Don H. Compier (Ph.D. in theology, Emory University) is Dean of the Bishop Kemper School for Ministry. He also serves as Canon Theologian of the Episcopal Diocese of Kansas and presides at the Spanish service at St. Paul’s in Kansas City, Kansas. Previously, Compier taught Master’s and Ph.D. courses in theology, philosophy, and modern church history at the Church Divinity School of the Pacific and the Graduate Theological Union in Berkeley, CA. He has also offered classes at Saint Paul School of Theology and Eden Theological Seminary. He led the graduate program in religion at Graceland University from 2002 until 2014, developing an innovative online curriculum. He is currently researching the history of Eucharistic thought in Anglicanism. This course provides an introductory survey on historical and contemporary racism in America and the role the Episcopal Church has played both in supporting and dismantling such racism. Through our work and conversation, we will explore how systemic oppression, specifically but not limited to racism, plays a role in creating barriers to true multicultural diversity and racial harmony. We will also discuss how to move congregations down the continuum from “exclusive” to “transformed” spaces. This workshop satisfies the canonical anti-racism requirements for clergy and lay leaders. Williams, Chad; Williams, Kidada; and Blain, Keisha (eds.). The Charleston Syllabus: Readings on Race, Racism and Racial Violence. University of Georgia Press: 2106. The implications of pneumatology for thinking about Christian theology have changed drastically across Christian history. This course will explore the theological implications of pneumatology in terms of historical, dogmatic, and contemporary constructive theologies. Not only will we consider how doctrines of the third person relate to understandings of the first and second persons of the trinity, we will more closely consider how formulations of the doctrine of the third person have often been considered in light of the systematic ramifications of this doctrine for other traditional loci such as ecclesiology, revelation, and salvation. Shelly Rambo, Spirit and Trauma: A Theology of Remaining (Louisville, Ky: Westminster John Knox Press, 2010, ISBN 978-0-664-23503-1). Veli-Matti Karkkainen, Pneumatology: The Holy Spirit in Ecumenical, International, and Contextual Perspective (Grand Rapids, Mich: Baker Academic, 2002, ISBN 978-0-8010-2448-1).